Chances are, you’ve been hearing calls to action since you could walk, talk and squabble with siblings. Moms and Dads, and the other trusted adults who watched over you, were your first exposure to them. They “persuaded” you to take action, you felt emotionally connected to the call and you clearly knew what desired action to take. It happened within seconds, without pause for thinking and usually resulted in a positive ending for everyone involved. Fast-forward a few years, and insert calls to action into a more professional setting, but their purpose is still the same: to drive people to take a specific, intended action. Strong calls to action comprise words or short phrases and are often tied to promotional or informational pieces, like solicitations or donor-profile stories. They sound like a “Contact Jane Smith, executive director, for more information” at the end of an article, or a “Join the cause” button at the end of a web page, for example. Calls to action are conduits, moving readers from passively receiving the mission story to actively championing the mission’s work. Getting people to act on good intentions requires that we connect compassion with action. Make It Urgent. As nonprofits, we often work in two dimensions, both separate but very linked—the right now affecting a better tomorrow. An effective CTA bridges those two dimensions for our readers: The actions they take right now will directly affect a better tomorrow. So be brief with a CTA and get to the point with short, direct and of-the-moment phrasing. I would submit that Lifewater’s entire web page works as a CTA. The most compelling statements are “above-the-fold,” or the first thing you see when you click through the link. It’s tightly written in short, direct phrases. It also implies immediacy, with “Give Water.” Then the direct payoff “Give Life.” and other more specific payoff benefits are listed underneath. The CTA at right, “Tell me how I can give a village clean water!” offers quick and easy action; and the simple, solitary exclamation mark is effective in showing urgency, along with an eye-catching blue button that mimics the color of water and nicely ties in the background image. Make It Match Readers’ Emotional Desires. Always be truthful and don’t overstretch, but—where appropriate—show the emotion behind the story. Constructively used, emotions light the fire to give. A personal connection ignites and the call to action becomes undeniable. 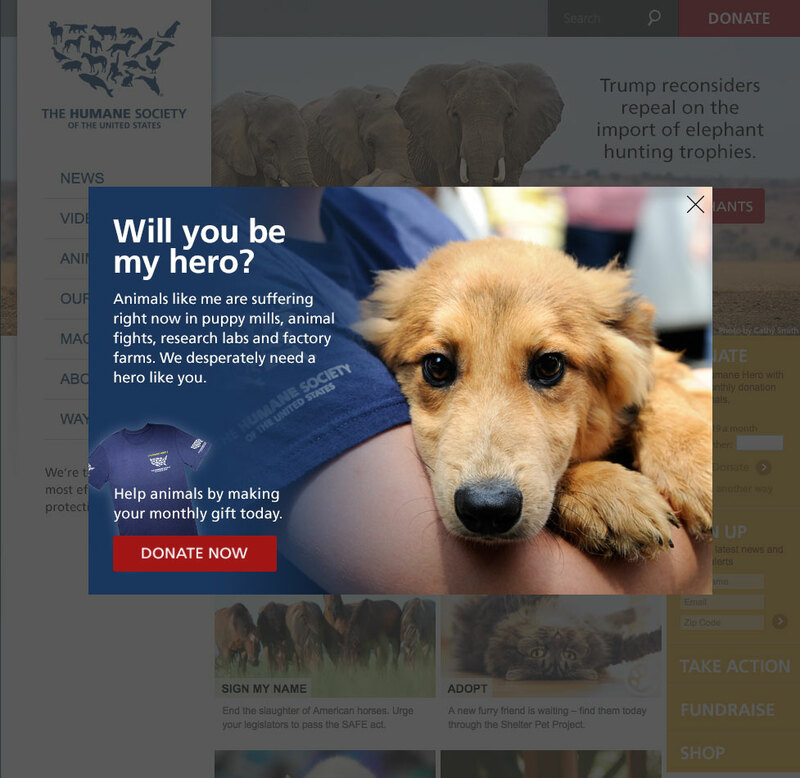 Across all mediums, print and digital, The Humane Society of the United States uses impactful CTAs by demonstrating the dire, immediate need for animal care. Just when our hearts can’t take it anymore, the CTA swoops in and offers a direct line of action to solve the despair: “Help animals by making your monthly gift today” with a plain-to-see donation button. Their homepage’s pop-up, shown here, also delivers an immediate payoff to the viewer. The Humane Heroes t-shirt, pictured directly behind the CTA, enhances the sense of receiving a benefit for the action (payoff #1) and social exclusivity (payoff #2). Make It Easy to Find. Readers can’t take action if they don’t see what it is we want them to do. Attract their eyes to the CTA by graphically setting it apart with larger or bolded headlines (see Stelter’s other tips for print CTAs below). Also, understand how to use colors in CTAs so they invoke the feelings and intended actions you want to achieve. This enlightening four-part series on CTA buttons starts with the psychology of color. It’s simply the way of the world: Print CTAs have to work harder than their digital counterparts because of print’s inherent two-step process. “With social media or the web, you’re already in the medium,” says Stelter’s Editorial Director Katie Parker. “But with print, I have to put down my piece and pick up the phone or mail something in or boot up my email. Experiment with subtle graphic elements that complement and draw attention to CTA headlines, says Senior Editor Erin Piel. At Stelter, we’ve experimented with headlines and concepts like “Even 1 Percent Matters” with a pie chart showing a tiny slice (1%) highlighted or “Time Is Running Out” with a clock next to it. In recent articles, our editorial team wrote the brochure offer into the CTA rather than as a separate promo box. The brochure expanded on the ideas introduced in the article, so it freed up space for the design to call more attention to the CTA. Think beyond “Submit.” These types of CTA buttons conjure up long, time-consuming forms and giving up some degree of privacy. This may not always be true, but sometimes virtual perception is reality for readers. For newsletter signups, Piel instead suggests buttons like: Find Out First (implies exclusivity/insider status) or Join Thousands of Others (provides social proof/sense of belonging). For an educational information download try Get Started Now (delivers instant gratification). Any tips you’ve acquired for writing stronger CTAs? Feel free to share in the comments section below. While you’re here, check out “4 Tips to Make Your Landing Pages Worth Landing On” for an entire package of ideas to better engage your audience.